Harris Brothers of Chicago was a manufacturer of kit houses from 1907 until 1931. They didn't use testimonials in their advertising very often. In their 1928 Harris Homes catalog, they featured a letter from Owen Rietveld, who happened to live in Harvey. Testimonial from the 1928 Harris Homes catalog. Model No. 1018 came in two floor plans--A and B. 287 E. 148th Street, Harvey. Photo courtesy of Cook County Assessor. The Wilmette from the 1928 Building Materials Catalog (also known as No. 1018). 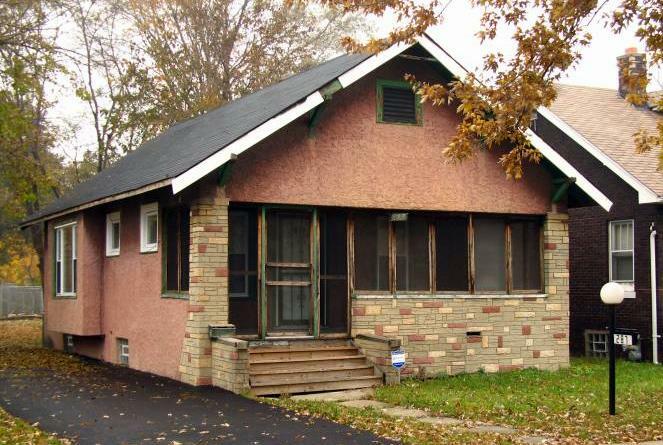 "Here is a charming California bungalow with all the conveniences you could wish for. There is nothing lacking in exterior elegance or interior comfort and room arrangement. The broad, spacious porch, covered by the main house roof with its strong supporting brackets and the divided-light window in the gable place this building in a class far beyond the ordinary type." The house came delivered with cedar shingles or bevel siding. Sometime after construction it was stuccoed over. Cook County says the build year is 1923, I suspect it might be as early as 1921. The house was not there in 1920 since Owen was living at home with his parents, according to the census. Owen, a truck driver, lived in the Wilmette with his wife, Pearl, and son, Owen Junior. The Rietvelds owned the house until the 1960's.